Caring and thriving communities and a quality rural lifestyle. The Upper Hunter Shire has a population of about 14,000 and covers about 8,100 square kilometres in New South Wales, Australia. The shire includes the townships of Scone, Aberdeen, Merriwa and Murrurundi and smaller villages also worth exploring in an area of great natural beauty. Agriculture and the equine industry are major producers in the region. 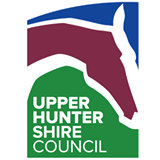 The Upper Hunter Shire Council was formed in March 2004, by proclamation of the NSW Minister for Local Government, amalgamating the former shire councils of Murrurundi, Merriwa and Scone. Council has offices in all these towns that are open on week days. If you have questions, requests for action, comments, complaints or other enquiries on the wide range of services offered by the Upper Hunter Shire Council visit our official page www.upperhunter.nsw.gov.au or contact us as above.